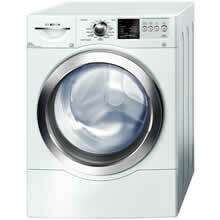 WFVC5440UC is a front-loader washing machine from Bosch. This washer is energy-star qualified and has various features. The unit has a dimension of 36 7/8'' x 27'' x 29 3/4'' ". The unit costs $ 1,249.00. Eco-Smart Technology - Ensures the efficiency of the product through its intelligent network of sensors. This makes washing easier and efficient. Stain Removal Option - This feature ensures the removal of various types of stain in just one cycle. You don't have to spend time rubbing stains off. Comforter Cycle - This one allows you to wash bulky comforters and blankets efficiently. Jeans Cycle - This feature makes sure that your denims are cleaned well without you worrying about the fading and the wrinkling effect. Active Clean - This feature makes sure that the laundry are cleaned thoroughly and efficiently. BabyCare Cycle - This cycle cleans using extra-water and high temperatures for the thorough cleaning of baby's clothes. Wool/Handwash Cycle - This feature allows the gentle cleaning of delicate and sensitive fabric. AVS Anti-Vibration System - This feature keeps the operation of the machine smooth and quiet. AquaStop Leak Protection - The AquaStop Leak Protection System prevents major water damage on the washer. Allergy Rinse Option - This feature makes sure that the clothes washed are free from detergents that could cause allergy. This washer is certified by NSF to kill 99.9% of bacteria. Another good thing about this is its energy-saving quality. This unit is actually Energy Star Partner of the Year for 2009. It is also a very water-efficient brand of washer. Aside from these, this model is designed to operate silently and smoothly. With this washer, you can wash clothes even in the middle of the night. The washer also has many cycles, amounting to 15. This adds to the cleaning efficiency of the product. This also has a special cleaning cycle for comforters, denim, and also for delicate clothes. With this unit, stains are also easier to remove. This machine is designed with a stain removal option. The washer has a water leak protection system which minimizes the risk of water damage on the whole unit. This unit has many good points, But it also has a lot of bad ones. For one, the price is costly. There are some units with matching dryers with much lower price than this one. Another drawback about this item is the design and color. If you have a modern-looking laundry room, this washer is not really the best appliance to install, aesthetically speaking. There are some consumers who complain that this washer is not really very durable because the pumps break after several months of using the washer. I bought this Bosch Washer new for my new home. On the first day, I ran it to do a test wash. At the end of the cycle, I got error code E:27, and the door won't open. Turns out this is a common problem with Bosch, and a repairman needs to come and replace the door lock (which will take a week). Not impressed. terrible customer service. Have had this model for a week and error 27 will not allow the door to open. Had someone come out to look at it and it will take a week or two to get this repaired. They were not helpful on the phone and did not take immediate action to get this problem resolved after only owning this machine a week. This Bosch Nexxt 500 Plus replaced our Whirlpool Calypso, so we were delighted to have a washer that actually got clothes clean. Cons: require at least two items of similar weight for spin to work. Heavy items won't spin. Stop signal goes on forever until you turn it off manually. Requires to keep the door open to dry interior to prevent mold. Now, the fabric softener dispenser fills with water and won't drain, so after each load I have to remove the dispenser and drain the water. Maytag and Whirlpool make garbage products and I'm now adding Bosch to my list.